Originally a Spanish ranch that grew lima beans, Beverly Hills is now one of the most famous neighborhoods in Los Angeles, recognized for Rodeo Drive, its high-value real estate, and multiple references in film and television. Investors came looking for oil but found water instead, making it a prime location to build a town. Beverly Hills was incorporated in 1914, named after Beverly Farms in Massachusetts and the hills in the immediate area. 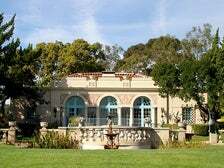 The city’s glamour and appeal to Golden Age Hollywood movie stars were established when Douglas Fairbanks and Mary Pickford bought land to build Pickfair, their legendary 56-acre estate. Explore the hidden gems of Beverly Hills and you’ll soon become an expert on an LA neighborhood that’s known around the world as the epitome of luxury and style. Beverly Hills is often associated with a rich and luxurious lifestyle, but there's plenty to do for those on a budget. Whether it’s free museums and attractions, or happy hours and famous cupcakes, here's how to do Beverly Hills like an insider.